We have a flowering Cherry tree in front of our house. It is so beautiful when it is fully bloomed. All pink, like cotton candy. But... once the tree sheds it's blooms it turns into a big pink mess. Still pretty, but a mess. 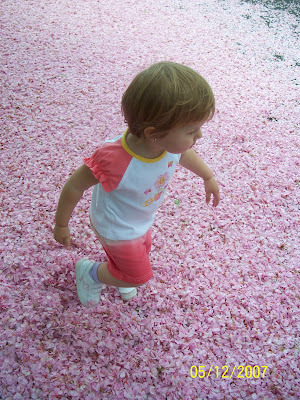 Zoe was really curious about all of the pink petals. She was careful at first to walk around the big mass of pink. After I convinced her to run through them she was so excited. 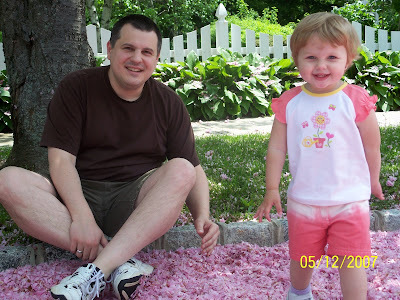 Zoe and Daddy check out the cherry blossom mess. 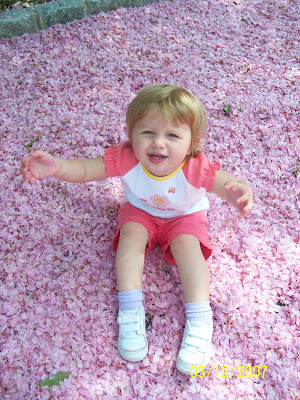 You can see that Zoe wasn't a big fan of sitting in the petals. She couldn't stand up because she refused to put her hands in the petals. She doesn't like her hands dirty!